Nigeria’s Super Eagles have moved up on the FIFA World Rankings from the 46th position to 42nd after their Africa Cup of Nations win against Seychelles and the 1-0 pipping of Egypt in a friendly game in Asaba, Delta State. 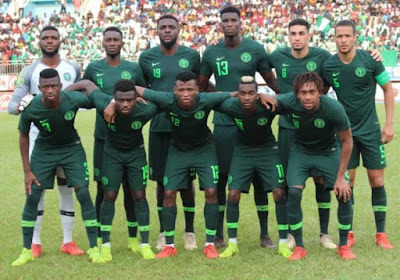 The Super Eagles with the April ranking are now third behind Senegal and Tunisia in the African national teams ratings. The three-time African champions now sit behind Senegal  and Tunisia in the continental standings while Morocco , DR Congo , Ghana , Cameroon , Egypt , Burkina Faso  and Mali  completed the top 10.